Abstract. In population-based studies, renal transplantation has been shown to improve survival compared to dialysis patients awaiting transplantation in the United States. However, dialysis mortality in the United States is higher than in Canada. Whether transplantation offers a survival advantage in regions where dialysis survival is superior to that in the United States is uncertain. This study examines a cohort of 1156 patients who started end-stage renal disease (ESRD) therapy and were wait-listed for cadaveric renal transplantation in the province of Ontario, Canada between January 1, 1990 and December 31, 1994. Patients were followed from wait-listing for renal transplant (n = 1156), to cadaveric first renal transplant (n = 722), to death, or to study end (December 31, 1995). The annual crude mortality rates for wait-listed dialysis patients and transplanted patients were 5.0 and 3.4%, respectively. In Cox proportional hazards models, mortality in wait-listed patients was associated with increased age and diabetes, but not time from onset of ESRD to wait-listing. Factors associated with death following transplantation include older age, diabetes, and longer time spent on the waiting list before transplantation. In a time-dependent Cox regression model, the relative risk of death after transplantation compared to dialysis varied in a time-dependent manner. Covariates associated with increased risk included older age, diabetes, and time from onset of ESRD to wait-listing. The average relative risk (RR) of dying was 2.91 (95% confidence interval [CI], 1.34 to 6.32) in the first 30 d after transplantation, but was significantly lower 1 yr after transplantation (RR 0.25; 95% CI, 0.14 to 0.42), indicating a beneficial long-term effect when compared to wait-listed dialysis patients. This long-term benefit was most evident in subgroups of patients with diabetes (RR 0.38; 95% CI, 0.17 to 0.87) and glomerulonephritis (RR 0.13; 95% CI, 0.04 to 0.39) as the cause of ESRD. The survival advantage associated with renal transplantation is evident in this cohort of patients with a lower wait-listed dialysis mortality than that reported previously in the United States. The magnitude of the treatment effect is consistent across studies. Studies reporting better patient survival with cadaveric renal transplant than with chronic dialysis (1,2) may exaggerate the benefit of transplantation due to a failure to consider the impact of patient selection and time-to-treatment biases (3). These biases favor those treated by transplantation. Port and colleagues (4) have reported better survival with cadaveric renal transplantation than with dialysis in a cohort of end-stage renal disease (ESRD) patients from Michigan. Their methods minimize bias in two important ways. First, selection bias was minimized by comparing the survival of transplant recipients with those dialysis patients placed on a transplant waiting list. As a result, patients who died early in their dialysis treatment or those who were elderly or too sick to receive a transplant were excluded from the analysis. Second, time-to-treatment bias was controlled using a time-dependent Cox regression model. This technique adjusts the survival analysis by attributing the survival time before transplantation to the dialysis group and by considering the higher risk of death, which typically occurs early in the post-operative period after renal transplantation. By effectively controlling for these important biases, Port et al. (4) have provided convincing evidence that cadaveric renal transplantation improves long-term patient survival. However, these findings may not be generalizable to other countries, because patient mortality in the United States for both hemodialysis (5) and peritoneal dialysis (6) is significantly higher than in other countries. It is possible that the improved patient survival with transplantation observed in the United States may be exaggerated by higher mortality rates seen in patients treated with dialysis. This question has been addressed in a single-center, prospective comparison of a small number of wait-listed dialysis patients and those receiving cadaveric renal transplantation in Mannheim, Germany (7). Although this study confirmed a long-term survival advantage for cadaveric renal transplant recipients, relatively low-risk patients were offered transplantation, raising the question of whether these results may be generalizable to North America. In the Mannheim study, less than 10% of the total study population had diabetes, and the annual mortality of wait-listed patients was unusually low at 3.2%. In comparison, the crude annual death rate of the wait-listed dialysis patients in the study by Port and colleagues (4) was 10.7%. More than 30% of the wait-listed population had diabetes. To address the generalizability of these results to Canada, we have performed a survival analysis using a time-dependent Cox model on a population-based cohort of dialysis and transplant patients in the province of Ontario, Canada. The study population consists of all patients in Ontario, Canada who first started ESRD therapy after January 1, 1990, and were placed on the cadaveric renal transplant waiting list between January 1, 1990 and December 31, 1994. Patients were identified for study using both national (Canadian Organ Replacement Register [CORR] and provincial (Multiple Organ Retrieval and Exchange Program [MORE]) dialysis and transplant databases. Because the two databases did not contain unique identifying variables common to both, patients were matched using a combination of birthdate and gender. Using the above inclusion criteria, 1156 patients were studied from the time of wait-listing. They were followed to cadaveric renal transplantation, death, or study end (December 31, 1995). Demographic and clinical information of the study population was taken from the CORR and MORE registries. Data obtained included date of birth, gender, race (Caucasian, non-Caucasian), cause of ESRD (diabetes, hypertension/renovascular disease, glomerulonephritis, hereditary renal disease, other), start date of first ESRD therapy, date of wait-listing for transplantation, date of transplantation, type of transplant donor (cadaveric or live), and dates of last follow-up or death. The immunosuppressive protocols throughout the study period generally consisted of a triple drug regimen with cyclosporin A, azathioprine, and prednisone. Mycophenolate mofetil was used in 31 patients who participated in the Tricontinental Mycophenolate Mofetil Randomized Trial (8). The study was approved by the Ethics Review Board of St. Joseph's Hospital. Those who received a renal transplant as their first mode of ESRD therapy were excluded. Although some patients may have been temporarily removed from the waiting list due to medical illness, they were analyzed as though they remained on the waiting list from the date of first listing to transplantation, death, or the end of the study period. 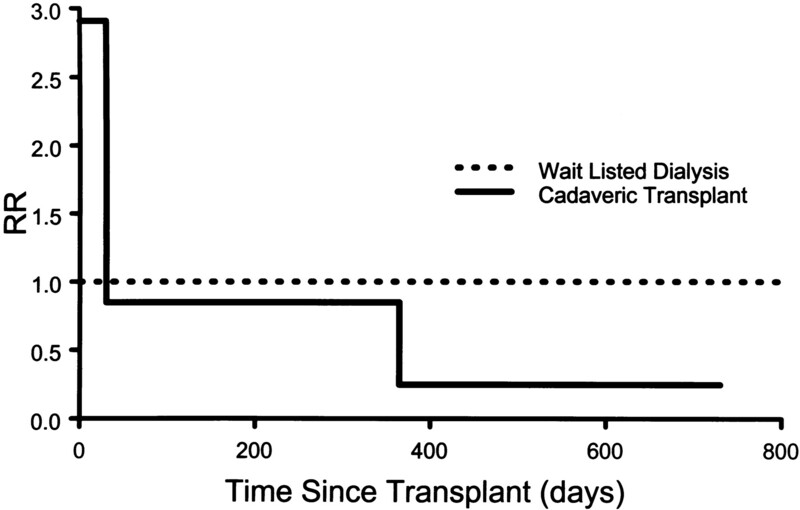 This prospective cohort study design considered patient survival from the date of transplant wait-listing. The clinical outcomes were transplantation and death. The independent variables were gender, race, primary cause of renal failure, age at wait-listing, time from first ESRD therapy to wait-listing, and time from wait-listing to transplantation. Data were censored at the conclusion of the study (December 31, 1995). Factors associated with mortality risk in the dialysis and transplant patient groups were investigated with Cox proportional hazards modeling. In the dialysis group, the variables considered were age, diabetes as the cause of ESRD, gender, race, and the time from start of ESRD to wait-listing. For the transplant group, these same variables plus the time from wait-listing to transplantation were included. In these analyses, all the patients contributed follow-up time to the dialysis group, whereas those transplanted had their subsequent survival attributed to the transplant group (9,10). Patients who received a transplant were censored in the dialysis group analysis. Wait-listed patients who received a live-donor transplant or whose donor type was unknown were censored at the time of transplantation, and contributed survival data only to the dialysis group. A time-dependent Cox regression model was used to study the non-proportional hazards effect of transplantation on patient mortality. The risk of death following transplant is highest immediately after the surgery and drops progressively over time. Thus, transplant has a nonproportional effect on mortality over time compared to nontransplanted patients. The analysis was controlled for the baseline variables of age, gender, race, and time from first ESRD treatment to wait-listing. The transplant effect is reported as relative risk (RR) of death, which is the ratio of death rates among transplanted patients relative to dialysis patients still on the waiting list. The average relative risk of death was estimated for each of three intervals of time following transplant: 0 to 30 d, 31 to 365 d, and more than 365 d. This adjusted analysis was repeated for cause-specific ESRD, comparing transplanted patients with wait-listed patients with the same cause of ESRD. During the study period, 1156 patients started ESRD therapy and were wait-listed for cadaveric renal transplantation. First cadaveric renal transplants were received by 722 of these patients. Six patients were lost to follow-up after renal transplantation. Table 1 shows the distribution of race, gender, age, and cause of ESRD at wait-listing and at cadaveric renal transplantation for both the Michigan cohort previously reported (4) and this study. In this study, the majority of the population was Caucasian. The mean age of the population at wait-listing was 44.3 yr and at first cadaveric renal transplant 41.9 yr.
Those patients who were not wait-listed had a crude mortality of 21.9%, compared with 5 and 3.4% in patients who were wait-listed and transplanted, respectively. The wait-listed dialysis cohort had a fourfold lower unadjusted crude mortality rate when compared with dialysis patients not wait-listed. Factors associated with mortality were examined separately in the wait-listed dialysis group and transplant group using a Cox proportional hazard model. In both patient groups, there was a significant increase in the risk of death associated with increasing age and diabetes as the cause of ESRD. Every increase of age of 1 yr is associated with a relative risk of death of 1.03 (95% confidence interval [CI], 1.01 to 1.05) in dialysis patients, and a relative risk of death of 1.04 (95% CI, 1.01 to 1.06) in transplanted patients. ESRD due to diabetes was associated with a relative risk of death of 3.88 (95% CI, 2.53 to 5.95) and 3.42 (95% CI, 1.99 to 5.87) in the dialysis and transplant groups, respectively. Neither gender nor race was associated with the relative risk of death in either group. Time to transplantation is composed of two periods, measured from the start of dialysis to wait-listing and from wait-listing to transplantation. These two time periods were analyzed as covariates in the models. In the Cox proportional hazards model, the amount of time from the initiation of ESRD therapy to wait-listing was not significantly associated with increased mortality risk in either the dialysis (RR 0.92; 95% CI, 0.83 to 1.03) or transplant (RR 1.34; 95% CI, 0.85 to 2.12) groups. After renal transplantation, the relative risk of death associated with each year spent on the waiting list was 1.42 (95% CI, 1.07 to 1.89). In the time-dependent Cox regression analysis, the amount of time on dialysis before wait-listing was significantly associated with increased relative risk of death following wait-listing (RR 1.35; 95% CI, 1.05 to 1.74 per year). Other variables associated with the relative risk of death were age and cause of ESRD, while gender and race were not (Table 2). The relative risk of death for each yearly increment for age was 1.035 (95% CI, 1.021 to 1.05). After adjustment for age, gender, race, diabetes as cause of ESRD, and time to wait-listing, there is a time-dependent relative risk of death following transplantation compared to wait-listed dialysis patients. When compared to wait-listed dialysis patients who had survived a similar time since wait-listing, the average relative risk of death increases in the first 30 d posttransplant (RR 2.91; 95% CI, 1.34 to 6.32), equalizes during the remainder of the first year posttransplant (RR 0.85; 95% CI, 0.54 to 1.32), and is followed by a lower long-term (i.e., beyond 1 yr posttransplant) average relative risk (RR 0.25; 95% CI, 0.14 to 0.42) (Figure 1). Average relative risk of death after renal transplantation in the time periods 0 to 30 d, 31 to 365 d, and greater than 365 d. Referent population is the wait-listed dialysis cohort. The effects of underlying renal diagnosis at each time interval are depicted in Table 3. The results of a similar analysis from a Michigan cohort by Port and colleagues (4) are provided for comparison. In this analysis, transplanted patients with a given cause of ESRD are compared within the time-dependent Cox model to wait-listed dialysis patients with the same cause of ESRD. Statistically significant reductions in long-term (i.e., >1 yr) patient mortality risk were observed for transplanted patients who had either diabetes (RR 0.38; 95% CI, 0.17 to 0.87), glomerulonephritis (RR 0.13; 95% CI, 0.04 to 0.39) or other causes (RR 0.22; 95% CI, 0.05 to 0.93) for their ESRD. Except for the finding of lower mortality risk in those with glomerulonephritis, these results are similar to those obtained by Port and colleagues (4) in Michigan. International comparisons of patient survival in the dialysis population using dialysis registry data suggest that patients treated in the United States have worse survival than patients in other countries (5,11). In the Canada-USA peritoneal dialysis study (12), the relative risk of death associated with peritoneal dialysis in the United States was 1.93 when compared with peritoneal dialysis patients in Canada. These observations raise the possibility that the beneficial effects associated with transplantation in Michigan are, in part, related to poor dialysis survival rather than favorable effects related to transplantation. In our prospective study, we have demonstrated that there is a long-term survival advantage associated with cadaveric renal transplantation, even when dialysis mortality is lower than that observed in Michigan. This effect was evident after controlling for age, gender, race, cause of ESRD, and time from start of ESRD therapy to wait-listing, and occurred after a transient increased risk of mortality in the early posttransplant period. The crude annual mortality of wait-listed dialysis patients was 5.0%, compared to 3.4% for those who were transplanted. Despite this small absolute difference in crude mortality rates, the beneficial effects of cadaveric renal transplantation paralleled those observed in the Michigan population. Schnuelle and colleagues (7) have reported annual dialysis and transplant mortality rates of 3.2 and 1.6%, respectively, with transplantation associated with a statistically significant survival advantage. The data from the United States (4), Germany (7), and this study indicate that the transplant treatment effect is similar across wait-list mortalities ranging from 3.2 to 10.7% per year. Two Cox models were used to analyze these data. Both models demonstrated that increased age and diabetes as the cause of ESRD were associated with an increased relative risk of death. The Cox proportional hazards model showed that each year spent on the wait-list increased the relative risk of death by 42% following cadaveric renal transplantation. A similar finding was reported by Silins and colleagues (13), but the magnitude of their results was not quantified. The association between longer waiting times and increased relative risk of death might be attributable to high pre-formed antibody titers, which have been associated with increased waiting times (14) and increased relative risk of death after transplantation (15). Another possible explanation is that prolonged time on dialysis after wait listing may be accompanied by worse atherosclerosis, which might be responsible for the increased risk of death. In the time-dependent Cox model, every year following the initiation of ESRD therapy to wait-listing was associated with a 35% increased relative risk of death after wait-listing. This increased relative risk, although similar in magnitude, was not statistically significant in the Cox proportional hazards model for the transplant group alone. The discrepancy in these findings may be explained by the time-dependent model's use of time from start of ESRD therapy to wait-listing in both the dialysis and transplant groups, resulting in larger sample size and accompanying increase in statistical power. Cosio and colleagues have described a similar relationship between dialysis time pretransplant and mortality risk after renal transplantation. These investigators demonstrated that patient survival after renal transplantation decreased as the amount of time spent on dialysis pretransplant increased. Over a mean follow-up of 84 mo, 7% of those who were never dialyzed pretransplant had died, whereas in those dialyzed up to 3 yr and for more than 3 yr, 23 and 41% had died, respectively (16). Possible explanations for these findings can be divided into factors responsible for a delay in wait-listing and those that are the result of a longer time on dialysis. Among the former group of factors are development of uremic or dialysis-related complications in previously stable patients who had elected dialysis rather than transplantation and then required transplantation as a solution to these problems. Pre-ESRD factors may also influence the timing of patient wait-listing. For example, those patients with inadequate pre-ESRD care may have significant comorbidities that require careful and time-consuming assessment before wait-listing, which may result in increasing time on dialysis. Increased cardiovascular problems associated with longer time on dialysis (17,18), as for the longer time on the wait-list, is an alternate explanation. The beneficial effect of transplantation on patient survival has been established for those with diabetes (4,19), but the effect on other groups of patients is less clear. In the analysis adjusted for age, race, gender, and time from start of ESRD therapy to wait-listing, we observed that patients with glomerulonephritis had a significantly reduced risk of death after transplantation. Although this was not shown by Port and colleagues (4), it is consistent with a recent report (20) that showed that all ESRD patients treated with transplantation survive longer than wait-listed dialysis patients. There were two potential sources of bias in our study. First, the lack of unique identifying variables between the two databases from which the data were obtained necessitated manual matching of patient records according to birthdate and gender. Although this process may result in random error, it is unlikely that the treatment effect would be systematically biased to favor either transplantation or dialysis. Second, the wait-listed mortality may be inflated by the listing of medical high-risk patients who were subsequently permanently removed from the waiting list. The magnitude of this problem is unknown, but it has the potential to bias the results in favor of transplantation. These data were unavailable from the databases. Patient anonymity prevented the acquisition of the data from the transplant centers. However, the beneficial effect of transplantation on the long-term mortality risk is substantial and statistically significant. It is therefore unlikely that such a bias would significantly inflate the benefit of renal transplantation. In fact, Schnuelle and colleagues showed that the beneficial effects of transplantation persisted when survival analysis was limited to those dialysis patients who remained on the waiting list (7). Cohort studies have demonstrated a consistent transplant effect in different eras (1984-1989; 1990-1995; 1989-1997) and regions (Michigan; Ontario, Canada; Mannheim, Germany). These effects are present in both population-based (4) and single-center studies (7). The average relative risk of mortality 1 yr after renal transplantation ranges from 0.25 to 0.36 when compared to wait-listed dialysis. This treatment effect persists when wait-listed mortality rates vary widely (3.2 to 10.5%) and when the prevalence of diabetes ranges from as low as 10% (7) to as high as 30.8% (4). Although diabetes is a powerful predictor of death among patients treated with dialysis (6,19), these patients benefit from renal transplantation. These findings raise the question of whether other patients who are medically high-risk and are currently not transplanted can also derive survival benefit. In summary, there is a long-term survival advantage associated with cadaveric renal transplantation over dialysis. This difference was most pronounced in patients with diabetes and glomerulonephritis as causes of ESRD. The survival advantage associated with renal transplantation is a function of the treatment itself, rather than an artifact of elevated dialysis mortality. The increased risk associated with increasing time spent on the waiting list underscores the need to develop strategies to shorten waiting times. Dr. Rabbat is the recipient of a Regional Medical Associates of Hamilton scholarship and the Hoffmann-La Roche Fellowship of the Kidney Foundation of Canada. The authors acknowledge the efforts of Pat Winslade from the Multiple Organ Retrieval and Exchange Program of Ontario, and Norma Hall from the Canadian Organ Replacement Register. The data reported here have been supplied by the Canadian Organ Replacement Register (CORR), a registry of the Canadian Institute for Health Information. The analysis and interpretation of these data are the responsibility of the author and do not necessarily reflect official policy or interpretation of CORR.